I wrote my first installment of Ask Coach Deb on June 16 after getting a private Facebook message out of the blue from a lady named Lynn who just happened to be the daughter of one of my childhood friends. Lynn was embarking on her very first half marathon and hoped to gain some insight into what to expect and hoped that I would guide her along the way. Fast forward to this past Saturday when my new friend ran the Silver Comet Half Marathon in Georgia. Lynn and I have never met, but through Facebook messaging and emails, I was able to give her a helping hand during her training this summer and fall. She had already found a training plan online by the time she contacted me, but still had many questions during the course of her training. Question: I’m averaging a little over twelve minutes per mile. I’ve tried to speed up my pace, but twelve seems to be the lucky number! Is this an okay pace? Coach Deb: Of course a 12:00 pace is okay. I think for your first big race like this, finishing feeling good should be your number one goal. You can have time goals, but until you have a feel for how you do in this distance, I’d suggest not worrying about time. Question: I don’t know what to expect as to when the race starts, how to obtain my bib, etc… I signed up online months ago, but have heard nothing. Is that normal? Coach Deb: It is extremely uncommon for you not to be getting regular updates from the race director. Are you sure they have your correct email address? Otherwise, it sounds like it might be a very small race since I see on their website that packet pickup is only on race morning. Check out the info in the link I just sent to you about packet pickup, race start time, etc., and let me know if you have any additional questions. Question: I’m getting horrible blisters on my right foot. I just got new shoes in a larger size. Any other suggestions? Coach Deb: What type of socks do you wear? Look for an advertised blister free sock brand that fits snugly and doesn’t allow for rubbing like Feetures or Wright (affiliate links). Question: What type of things do I need to pack for the race? Coach Deb: Click here for my race items check list and other pertinent race information. The list is the first link on that page. Question: I read that I will get a virtual bag. What is that? Coach Deb: A virtual bag is a combination of special offers available to race participants – like 20% off of running related jewelry or a discount to a local running store. Question: Can you please help me figure out the course map? Everything on the map is all jumbled up! Coach Deb: I’m looking at the race map now and I’ve got to say that is one heck of a jumbled mess and even if you enlarge it, it’s hard to read. Don’t try to read the map; instead, click on the left where it says “89 more” underneath “Untitled Layer” and you will see what’s available at each mile – water stops, medical aid, porta potties, etc. 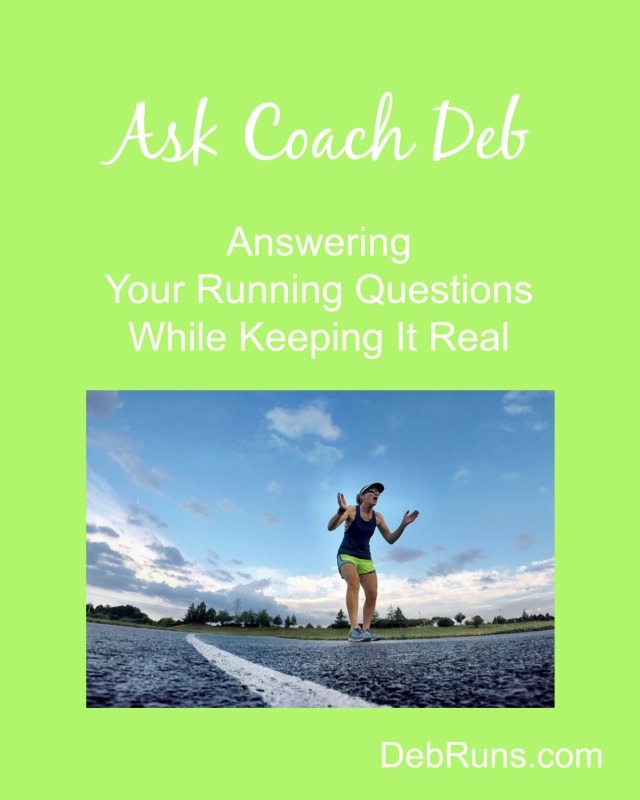 For answers to other questions you might have missed, check out my Coaching tab for previous Ask Coach Deb installments. What questions would you like to see answered next time? What other pieces of advice would you add to the above answers? Love your Q and A sessions!